How should a gay pediatrician deal with homophobic parents? As dismaying as the attitudes of some parents may be, I can’t address them if I never hear them to begin with. When I got my first job after completing my training as a pediatrician, I stopped wearing earrings. In my late teens, I got one piercing and then another in my left ear. I wore earrings all through medical school with nobody seeming to mind, and I did my residency and fellowship in New York City, where I presumed people scarcely noticed that kind of personal detail, much less cared anything about it. But when it came time to leave New York for my first “real” job, I found one at a practice in a much smaller city in Maine. I presumed that people there might be much more likely to notice if their kid’s doctor was wearing earrings and be more inclined to care. Out they went. When I reached out recently for other perspectives from LGBTQ medical providers, they uniformly shared a similar attitude. It’s not something they said they typically share with straight or cis patients, though a few said they were apt to be more open with those who were themselves gender or sexual minorities. But, in general, a non-issue. Several years ago, a couple of big shifts occurred for me. I joined a new practice in the northern suburbs of Boston, and my husband and I adopted our first child. Even though the new location was no guarantee of a progressive viewpoint from any given parent, I found myself less concerned about encountering biases against LGBTQ people. 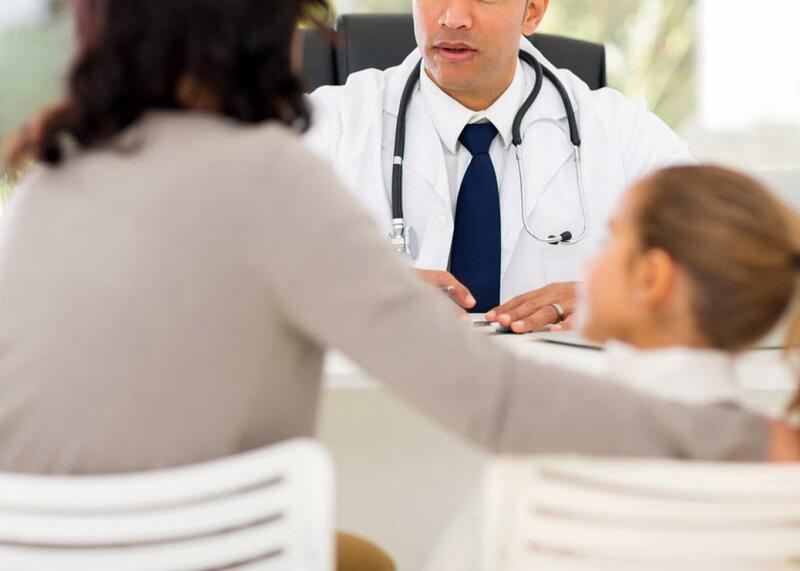 And because so much of what I discuss during patient visits dealt with various aspects of childrearing that aren’t strictly “medical” in nature, I increasingly referenced my own experiences, frustrations, and ideas as a parent. I remember the first time I used the word “husband” to describe the person raising kids with me, and the feeling of stepping off the high diving board that came with it. But each time I mentioned my own family’s makeup, that sense of trepidation lessened bit by bit. I can’t say I don’t feel any hesitation at all any longer, but it’s gotten pretty slight. Similarly, I’ve gotten less concerned about whether or not I read as gay. I’ve relaxed in my gestures and inflections, though the change may be perceptible only to myself. It seems I’m still modulating the way I sound on the phone, as I was recently reminded. I took a call at the office from a fellow gay writer, who started laughing at the octave jump my voice took once I knew it was him on the other line. Clearly, I’m still doing a little bit of code switching. All of this would remain safely in the non-issue territory, where I want to it stay, were it not for a few interactions I’ve had with parents. In these cases, parents have expressed concerns about the possibility that their own children might end up being LGBTQ. It’s dawned on me as I listened that they probably wouldn’t be sharing their concerns so frankly if they’d realized they were talking with a gay man. In one case, a parent expressed dismay at the tolerant attitude about non-heterosexual identity their teenager encountered at school, and speculated that their child might identify that way, too. In another, a parent observed the gender non-conforming ways their child liked to play, and discussed how unhappy they would be (and their spouse even more so) if this was an indication the child would grow up to be gay or trans. What matters to me about these interactions isn’t what they reveal about attitudes toward gay people like me—though it’s always disheartening to be reminded how far LGBTQ people have yet to go in even the most progressive corners of the country. What I care about as a physician is being able to advocate on behalf of my patients. As dismaying as the attitudes of some parents may be, I can’t address them if I never hear them to begin with. By coming across as a neutral audience for their worries, I can dissuade parents from trying to change their children, discuss the evidence of harm from trying to make LGBTQ kids deny who they are, and continue to be a resource for the family over time. I’m loath to inch anywhere close to anything that feels like a closet, professional or otherwise. I won’t be playing evasive language games about my spouse or fretting about whether my inflections or mannerisms seem straight enough. Even if I never decide to start wear earrings at work again—and my husband’s gentle suggestion that the silver hoops I tend to favor date me by a couple of decades doesn’t help—I can’t abide the thought of pretending to be something I’m not. But the goal of keeping my sexual orientation a non-issue seems as important as ever. Because of the dual nature of the care I deliver as a pediatrician, hearing the concerns of parents while keeping the best interests of my patients in mind, I have to be perceived as willing to listen to a wide range of beliefs about LGBTQ people, no matter how objectionable they may be to me personally. There’s no shame in the fact that I may serve some of my patients better by remaining a blank slate to their parents.